Freshman Eve Levenson speaks about remembering the victims of the Las Vegas shooting at the Shattering the Silence protest on Capitol Hill Sunday morning. Students and outside activists gathered on Capitol Hill Sunday to honor the anniversary of the Las Vegas massacre and demand national gun reform. 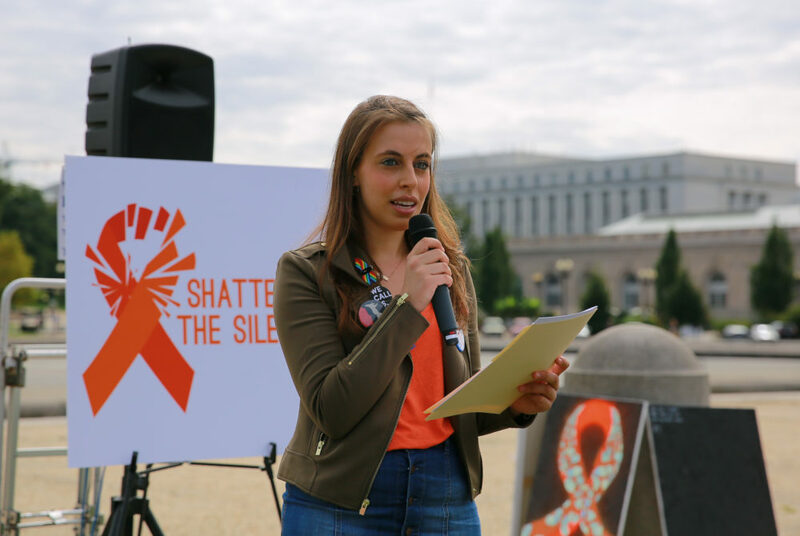 The event, which featured a vigil for the 58 victims of the Las Vegas shooting and a rally to change gun laws, was organized by freshman Eve Levinson, junior Ethan Somers and other GW students on behalf of Shattering The Silence D.C., a gun control activism group. Shaheera Jalil Albasit, a graduate student whose cousin Sabika was among the 10 victims of the Sante Fe High School shooting in Texas in May, read the name of each victim of the Las Vegas shooting. Albasit also said attendees should vote out sitting members of Congress who refuse to take action against gun violence, a repeated theme for speakers at the rally. “The only one way to ensure that everyone who has been lost to gun violence in this country actually gets justice is by depriving those people in the building of the power that makes them feel smug,” she said, gesturing to the Capitol Building. Holding signs saying “Our lives over NRA money” and “Disarm Hate,” protestors shared their own experiences with gun violence. One activist, Jaxon O’Mara, said she attended the event to honor her friend Jaelynn Willey, who was killed in a shooting that took two lives at Great Mills High School in Maryland. “When I found that out, my best friend and I collapsed on the floor crying,” she said. Havana Chapman-Edwards, a second-grader who was the only student at her Alexandria, Va., school to participate in the National School Walkout in April, emphasized the importance of youth involvement in the fight against gun violence. She said age never disqualifies an active voice for change. Robert Disney, the organizing director of the Brady Campaign To Prevent Gun Violence, said he had nieces and nephews who attended Columbine High School in 1999 where two teenagers killed 13 students and themselves. He said he attended the rally to combat the power of the National Rifle Association.